The diverse topography of India makes it one of the most exotic travel destinations in the world. The mesmerizing beauty of each and every part of the country has been acknowledged worldwide. Similar to how Indians can get Malaysia visa online, Malays can now get India visa online too. This article will help you in getting Indian E-Tourist visa for Malaysian citizens. It can provide an attraction to people of all tastes and temperament because of the unique and happy blending of modernism with oriental-ism. It is of no wonder why India is the preferred destination for tourists all around the world. The tourism industry is the biggest service providing industry of India and lately, the Indian government introduced ETVs (Electronic Travel Visas) and liberalized the visa policies and make it easy to get Visas online now. As per the statistics of the Bureau of Immigration, the number of tourists from Malaysia has increased steadily over time. Around 12,000 Malaysian citizens visited India in the first half of 2017. We had around 17,000 happy customers last year whom we helped process their Indian visas. Will it be possible for Malaysian citizens to avail visa on arrival at India? Like most of the other countries Indian government replaced the earlier visa on arrival system with ETVs from 2015 November. It takes around 4 days to apply for an E-Visa and get it approved. Since the Introduction of ETVs it has been mandatory for foreign nationals who come to India to have a valid visa when they arrive in India. The government of Indian has also instructed airlines operating flights to India, to make sure that the passengers who are flying to India hold a valid visa. Therefore, you need to have a valid visa to board a flight to India. How long does it take to get E-Tourist visa for Malaysian Citizens? It can take anywhere between two to four days to get your E-Visa approved. The application which you submitted along with the supporting documents will be verified by the designated officers from the Indian government. You will be asked to submit additional documents by the officers if they are not satisfied at any point of the verification process. Keep checking your email on a frequent basis to avoid missing any important correspondence from the Indian government. As per the official website of the Indian government you need to apply for an Indian E-Visa 4 days prior to your journey to India. However, considering the risk of last-minute confusions we suggest you apply 10 days prior to your journey. How many times can one enter India with a single Indian E-Tourist visa? Foreign nationals on E-Tourist visa or E-Business visa are eligible for double entry benefits while those on E-Medical visa can avail triple entry benefits. The visas are both non-convertible and non-extendable. What is the validity of my Indian E-Tourist visa? India E-Tourist visa is valid for 60 days from the date of arrival in India. Once your E-Visa and passport are verified at the airport immigration desk, the immigration officer will stamp your visa and write down the visa expiry date on your passport. Those tourists who are in need a visa with longer validity can apply for a sticker visa which is valid for up to 10 years. Unlike E-Visas, sticker visas can only be applied in person at the concerned Indian embassy after fixing a prior appointment. How much does it cost for India E-Tourist visa for Malaysian citizens? It costs Malaysian citizens MYR195.05 for Indian Visa. Bank charge of 2.5% will be charged additional on applicable e-Visa fees. We charge $25 as our service charge from customers who wish to avail our service. 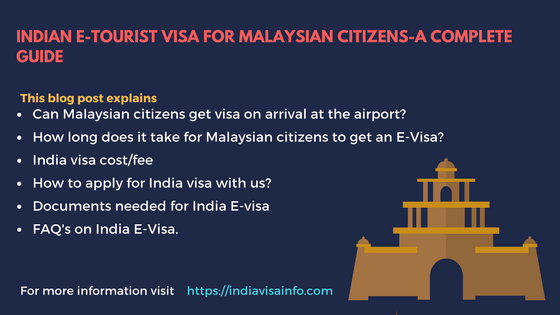 What are the requirements for India E-Tourist visa for Malaysian citizens? The only two documents that are needed to get Indian E-Visa. You have a passport that has at least six months of validity from the date of your arrival in India. The passport should also have at least two blank pages for stamping by the Immigration Officer. Once you receive your E-Visa emailed to you take a print out of it and keep it with you during your stay in India. Officers will ask for the printed copy of your E-Visa along with your passport at the immigration clearance desk for verification. After the verification is complete your visa will be stamped and your biometric information will be taken. How easy is to apply for an Indian E-Visa? The claims on applying for an Indian E-Visa becoming easier is however not completely correct. The online application portal makes the whole process hideous. There are a lot of issues with the portal because of poor maintenance and design making it very unreliable and unstable. You can find people ranting about it on Quora and other platforms. The major issue faced is with the online payment portal where one has to make a payment against his/her application because the banks are not capable of accepting any online payments properly. Therefore, someone going to the bank on your behalf to make the payment is the only reliable way. One has to make a payment successful within 3 tries. Failure to make a successful payment may result in your application ID blocked. Let our agents do the job for you if you want to avoid all these headaches and get your E-Visa easily. All you will have to do is fill in the below form and sit back and relax. Are there any discounts,if I want your help only with making a payment? For customers who avail our service only to make a payment we give them a 50% discount, we charge only $25 from them. How many times can I apply for E-Tourist visa in a year as a Malaysian citizen? Foreign nationals can apply a maximum of two times for an Indian visa in a calendar year. Therefore for visas with multiple entry benefits and longer validity, one should apply for a sticker visa. For medical tourists, separate immigration desks and help counters are set up at Delhi, Mumbai, Kolkata, Chennai, Bangalore, and Hyderabad airports. Once I place the order how long does it take you to confirm our order and get my Indian E-VISA? We will need a minimum of two working days to procure your E-Visa. Once our agents collect all the required information from you they will apply for your E-Visa on your behalf. Whom to contact if I need assistance with my visa application? You can contact us for any assistance with your visa application. Get in touch with us at care@indiavisainfo.com or call us at +919632751222. It was very complication for me while I applied through official website. Later on my money was wasted because my visa was rejected. I don’t know what was fault with my documents. And I do send the same to you guys and you guys provided me the visa within 4 days. Anyways I am so thankful to you guys. Authentic website to receive the Indian tourist visa without facing no big difficulties. I use this service for second time and the services were better both the time. I am so happy now, I received my visa . I hope you will took care of it very well. really professional. This is the very fast services for Online Indian visa service I have ever seen. Thank you for processing my visa very fastly. I was able to get my flight tickets because of earlier approval of visa and was confirm about my trip. Thank you so much guys. 100% trustful website..your service was very good and will be definitely worth for the money paid..I recommend to this website to all. recieved the e-visa for us just now…so happy to fly to India..all thanks to the people who looked after on our’s visa. thanks..very fast response from customer care reply..it is real time useful. comfortable zone to purchase the real Indian tourist visa..can trust this guys..